Bosch Founder Robert Bosch, an entrepreneur and philanthropist once said he “would rather lose money than the trust of his customers” This is precisely the reason behind the constant drive to create products that are both innovative and beneficial. Bosch establishes its first business hub in the Visayas strategically located Hiway Subangdaku Mandaue City Cebu. This is also the first expansion beyond Metro Manila to boost local presence and provide expertise in Power Tools, Automotive Electronics, Packaging Technology, Drive & Control Technology (Bosch Rexroth) and Security Systems. Cebu, as one of the most progressive metropolitan areas in the Philippines, is seen as a viable investment destination for foreign businesses, with its population size, high spending power, and robust growth in the real estate, business process outsourcing (BPO) and tourism industries. Bosch now sells its Power Tools in 13 showroom locations across Cebu. 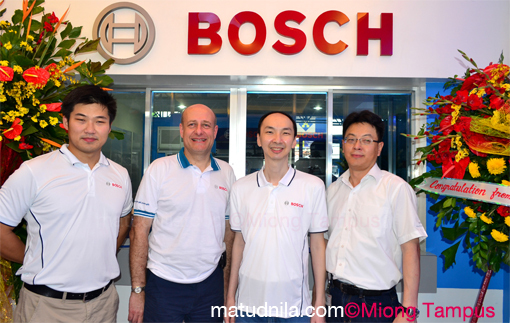 Bosch is also optimistic about the automotive industry in Cebu with the demand for automotive products is remain robust in this year according to Department of Trade and Industry. BCS and BDS offer professional diagnosis, maintenance and repair services for all gasoline and diesel vehicle models, built on the foundation of technical expertise and outstanding quality, supported by strong global branding. Bosch pioneered a community development project in Barangay Pari-an, Cebu, as part of its Skil Paint the Town Red campaign, which aims to generate livelihood projects for community members through workshops and power tool donations earlier this year. Robert Bosch Inc. (Philippines) is a 100% subsidiary of the Bosch Group, one of the world’s largest privately owned industrial corporations. 0 comments: on "BOSCH Philippines Opens first Representative Office in Mandaue City Cebu"
Cebu's Enriched Hidden Valley Resort, add to your Summer Wishlist!